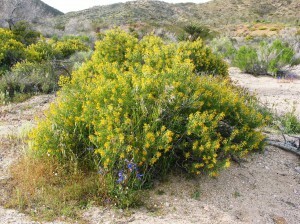 Coastal sage scrub, or “soft” chaparral, is the step-sister to the better-known “hard” chaparral, but in overall structure it is really closer to north coastal scrub. Slathering bluffs and hills close to the sea in a gray-green blanket from Monterey County south into Baja California, coastal sage scrub wanders inland where fogs linger or temperatures remain mild through the year. Coastal sage scrub may also rapidly, if temporarily, invade adjacent hard chaparral or oak woodland after fire. Despite the dominance of coastal sage scrub over a large domain, many ecologists consider it one of California’s most threatened plant communities because of the phenomenal urban sprawl in coastal southern California. The first impression of this assemblage of small, loosely knit shrubs may be disappointing in summer or fall, when many of the shrubs have lost most of their leaves to drought and are semidormant. With the resurgence of winter rains, however, the shrubs are magically rejuvenated with vigorous sets of fresh leaves. Happily, most of these shrubs can be maintained in full health in the garden by means of occasional summer water and excellent drainage. Coastal sage shrubs display a variety of intriguing leaf designs. Soon after new leaves appear, colorful, bee-pollinated flowers may also make their debut, lasting well into summer in years with cool, damp springs. These flowers light up garden spaces. Coastal sage is noted for its abundance of fast-growing, opportunistic shrubs and succulents. Cacti and dudleyas grow well in this arid habitat too, where the average rainfall is often less than fifteen inches, sometimes as little as ten. 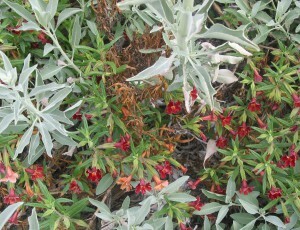 Coastal sage is noted also for the strong perfumes of its leaves. In fact, the community’s name comes from two different aromatic sources: species of sagebrush genus, Artemisia, in the daisy family; and species of sage, or Salvia, belonging to the mint family. Besides these, other members of the daisy, mint, sumac, and rue families add their own special aromas. Because of the plants’ oil-impregnated leaves, coastal sage scrub easily catches fire; it is best to plant the shrubs away from buildings, with a watered zone between. 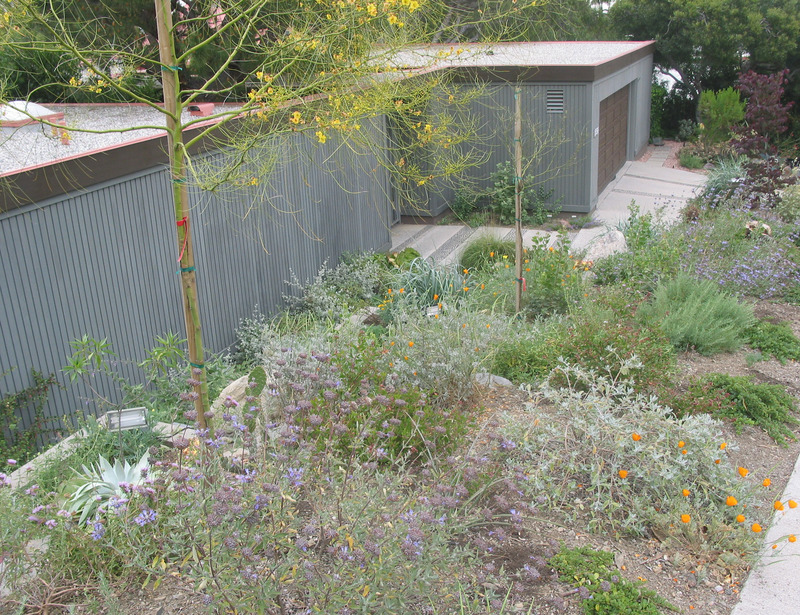 Coastal sage scrub is a perfect choice for gardens along southern California’s coast, allowing you to recreate lost habitat where most homeowners have not been so farsighted. You might, for example, combine two or three kinds of shrubs in large containers to create beautiful mini-portraits of this special habitat. Elements from the coastal sage scrub community are also ideal in an herb garden, where strong and pleasant fragrances help create a special ambiance. “Hard” chaparral shrubs can be mixed in to create a woody border, and various bunchgrasses, perennials, and bulbs can provide nice accents as well. Broad, fast-growing, multi-branched, semi-evergreen shrub to about eight feet tall. Bluish green, trifoliate, ill-scented leaves and tight racemes of golden, four-petaled flowers much of the year. 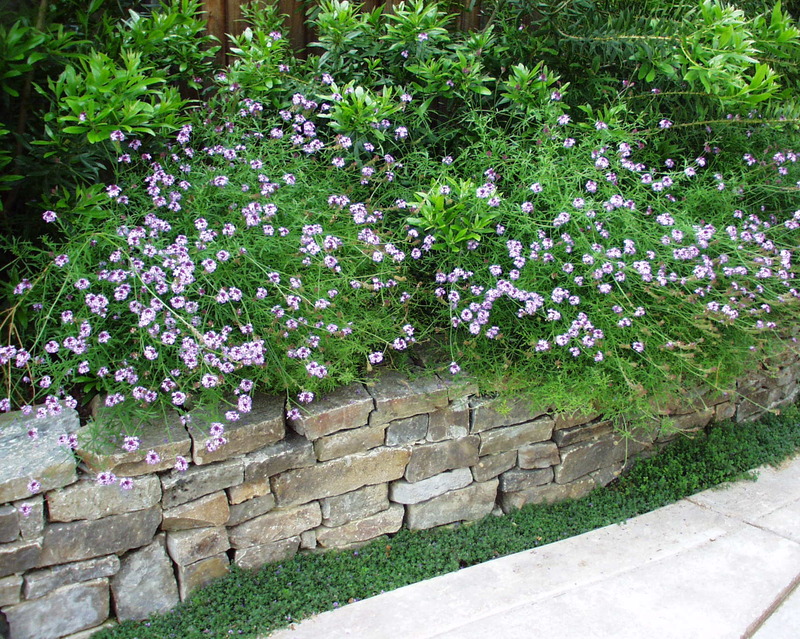 Woody-based, rounded perennial that creates tufts two to three feet across and high with small, deeply pinnately lobed, evergreen leaves and head-like spikes of sweetly scented lavender flowers. Flowers almost continuously in mild winters. Never cut into old wood. Dense shrub to three feet tall with clusters of narrow, dark green leaves. 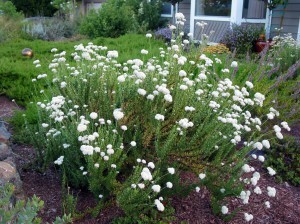 Flat-topped to rounded clusters of pink-budded, white flowers emerge in late spring and summer, becoming rust colored.